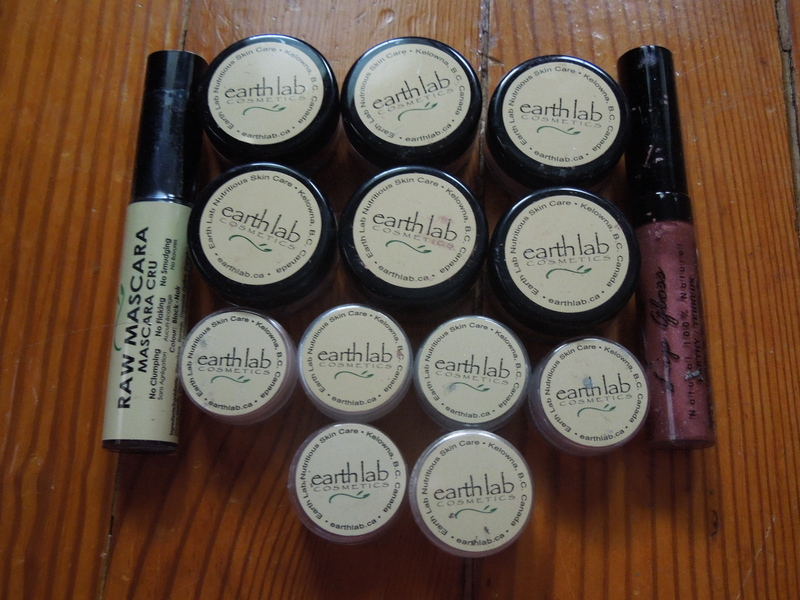 JULY PRODUCT REVIEW: Earthlab Cosmetics & a GIVEAWAY! – WINNER ANNOUNCED! In order to celebrate my milestone of surpassing 100 posts and to highlight July’s products from Earthlab Cosmetics, I’m hosting a giveaway! If you’re super impatient, you can jump down the post for all the details, but if you’ve got some time let’s dive into my review. This is a vegan makeup line that does not test on animals and does NOT contain: By-Products, Parabens, Toxic Chemicals,Bismuth Oxychloride,Preservatives. I’m always intrigued with trying out organic and vegan makeup, but I must confess that I’m not typically a fan of mineral makeup. I find it to be too much effort and a bit too messy for me. Let’s see if this brand changes my mind. I wear contacts and in general it’s hard for me to find mascaras and liners that don’t bother my eyes. Since this is natural it didn’t bug my eyes and it also didn’t flake or smudge. 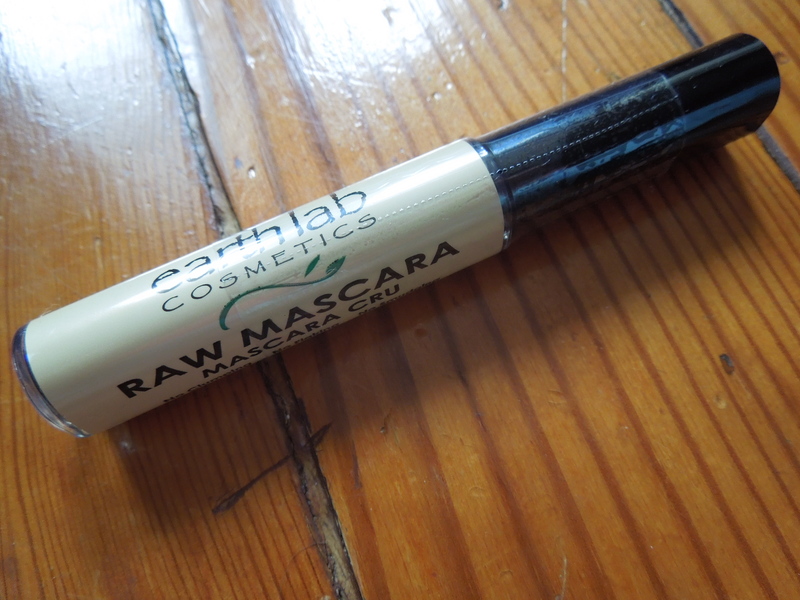 This mascara gives you a very natural, boho chic type of vibe. It’s not going to give you that super thick, heavy lash look, but it’s great when you’re going with a natural beauty feel. 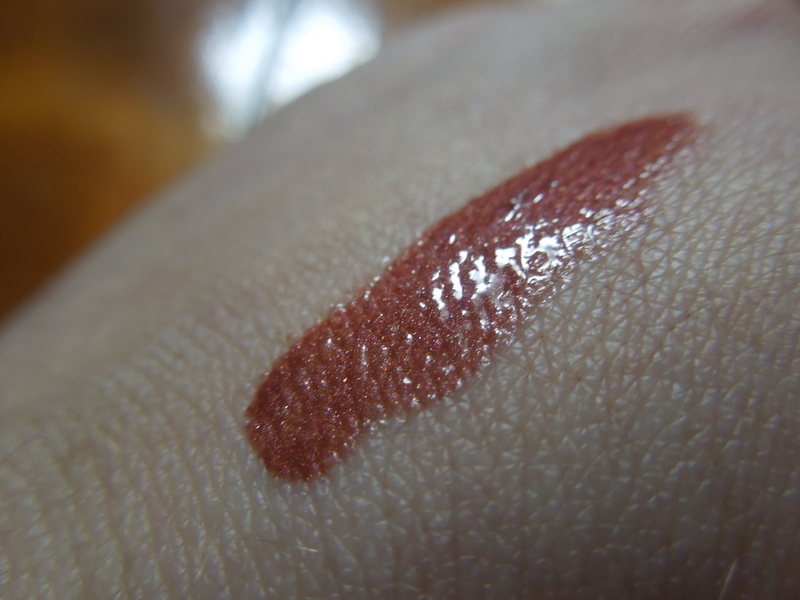 When I first glanced at this shade in the tube I was worried it would look terrible on me. But with the cooler skin tone, red hair and brown eyes it was a perfect shade. The consistency was a little odd to me at first since this had a more liquid feel and wasn’t quite as sticky as other glosses. 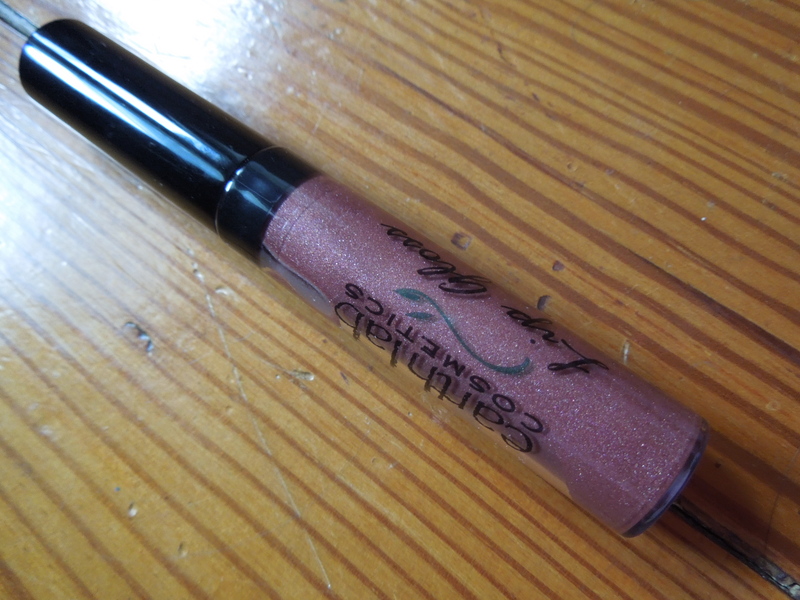 I got used to that quickly and found that it had excellent staying power for a gloss. So I’m usually intimidated by mineral makeup, but I grabbed a big old blush brush and gave this a try. While the sultry brown is far too dark for me, the apricot and peach both looked quite nice. 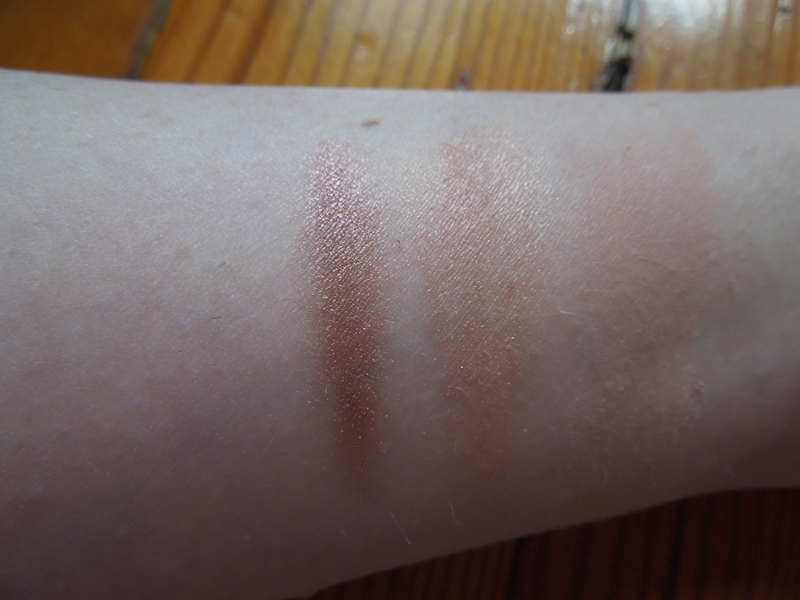 I was very surprised at how easily (and non-fussy) the blush went on. Very easy to apply and the peach and apricot both looked extremely natural on me. (Although the Apricot is my favorite). If you want a really natural cheek, these blushes are perfect. This applied easily but it was a bit shiny for my taste. I layered colors over it but I wasn’t really sure if it made a difference. I’m not quite sure how to use this one so I’m a bit on the fence about it. But maybe folks more experienced with mineral makeup will have a better time with it. 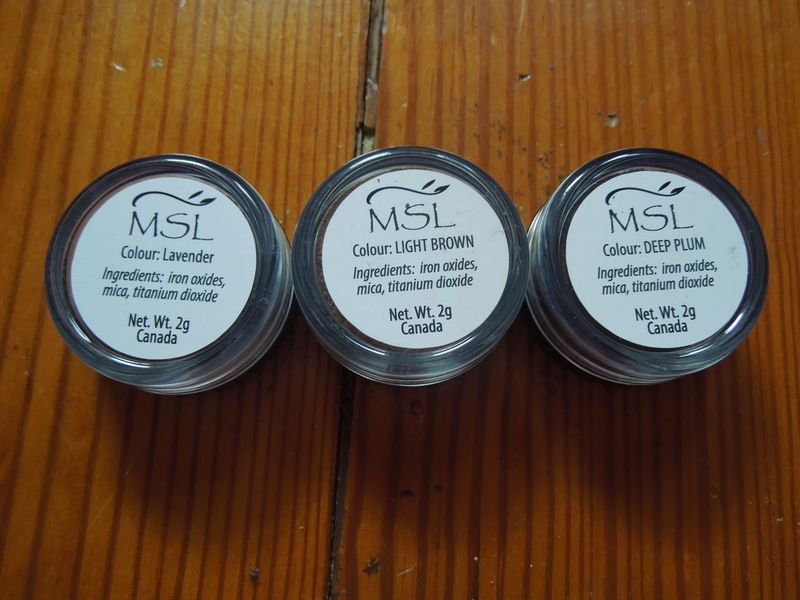 I only tried these out as eyeshadows because I don’t think I’m quite advanced enough with mineral makeup to attempt them as eye liners nor do I need to make my own nail polish. It took me a little while to figure out how much to tap off before application, but the colors went on nicely. They had a pretty, soft focus (almost watercolor) look. The light brown was a touch warm for me. I really like the two purple shades but I need to be careful since purple + my complexion = giant bruise. For me, these were the rockstars of the products I tried. These are so pretty going on and I found them to be easier to apply then the matte shades. The shimmer on these is beautiful and the Autumn and Sea Moss look amazing on. The shimmer on these sort of mimics the effect of a smoky eye so you can wear a lot of the shades on their own and still look amazing. I found this line to be a lot of fun to try out and it definitely helped me get more comfortable with mineral makeup. I think the colors and formulations give a fabulous laid back, boho, California vibe and I think it’s a great option if you are looking for a natural look. 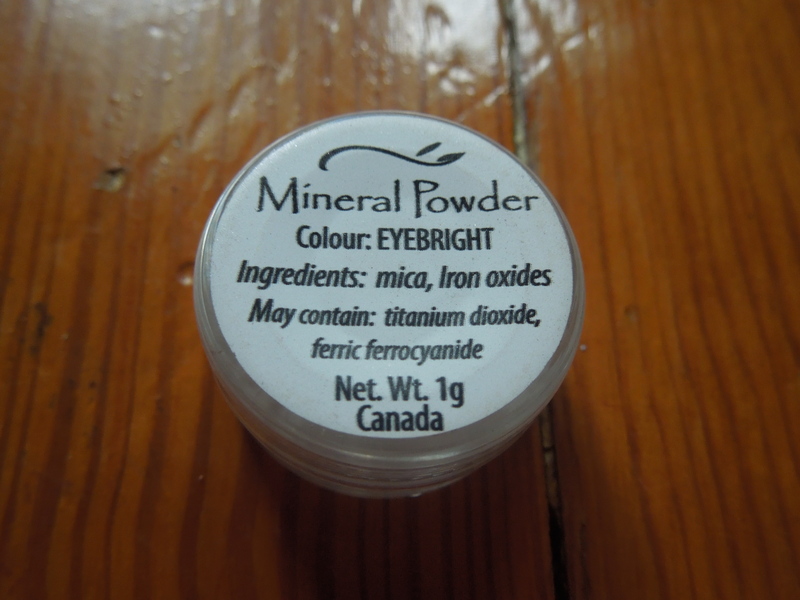 None of the eye products irritated me at all and I’m going to keep experimenting with their mineral products. 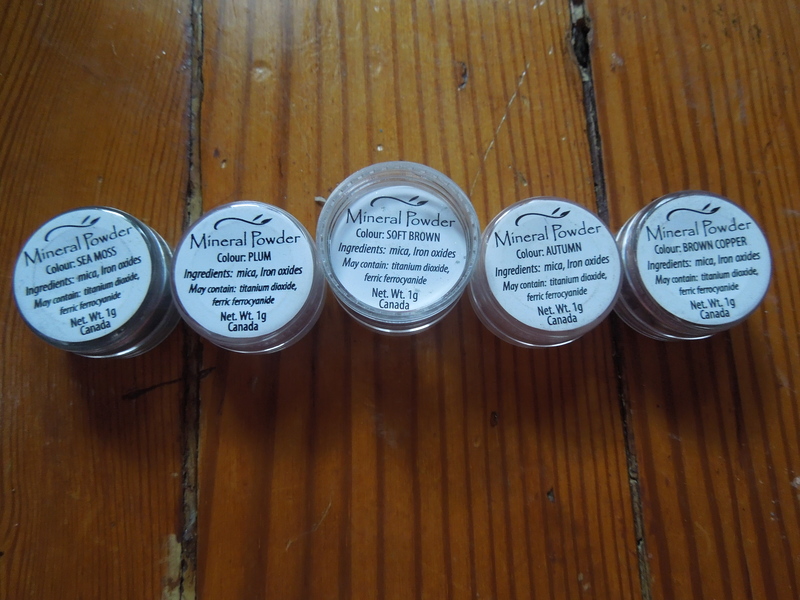 If I had to pick one product for you to try from the ones I reviewed, I’d suggest one of the eye shimmer mineral eyeshadows. They are so lovely and versatile. Do you swear by mineral cosmetics? Do you find them too messy or intimidating? Coupon Code: If you want to give these products a shot you can use my code at iherb.com: CVF809 for a discount on your first order. They are a fabulous place to buy everything from groceries to essential oils and they frequently offer freebies at checkout. I’m giving away a cosmetics set from Earthlab Cosmetics featuring a mascara,lip gloss, shimmer mineral eyeshadow and a mineral blush. This contest is open to US folks only (sorry my international peeps). Just leave a comment on this post before midnight (EST) August 7th. I’ll be choosing my winner at random from the comments. I’ll post the winner’s name after I’ve confirmed with them. And the winner for this giveaway is…(drumroll please)…Michelle Claxton! I’m pretty inexperienced with mineral makeup. Loose powders can sometimes be a little messy, but I like spraying loose eyeshadows with a bit of Elf Makeup Mist & Set to make them into a liquid eyeliner. I definitely need more practice, though! I really think the shimmer shades were much easier than the matte. It seemed like it was harder too put too much on. I still need a lot of practice though. I like mineral makeup for the most part. I use quite a bit of Bare Minerals or Bare Essentials, primarily the mineral veil, blush, and occasional eye shadows. I”ve found the mineral veil helps keep me from looking oily if I’m using a BB cream or other foundation-type makeup. I’ve never tried their mascara, though. I never really thought to use Mineral powder over a BB cream. I’ll have to consider trying that out. That gloss and those shimmer shadows look gorgeous! The shimmer shadows are even prettier than they photograph. I am very intrigued by that lip gloss color. It is very surprising. I was so sure it was going to be some weird orange on me, but it came out natural and lovely. Thanks so much for reading. Good luck! I’ve always liked mineral makeup but have never heard of this brand. I’d love to give it a try! Thanks for reading Courtney & good luck! Looks great! Would love to be the lucky winner! I love these! Such amazing colors! Yes, I was so excited to find out about this brand. Nice review! I don’t often wear much makeup, but I’d love to try one out! I think this line would work really well for someone who likes a more natural look. Good luck! I love the colors! Will have to check this company out! The shimmery eyeshadows are really beautiful. Shimmery stuff is always a good time! Shimmer and glitter are always fun. Thanks for reading! Love that the line is vegan!! Definitely, good vegan makeup can be really hard to find. I haven’t head of this company before, but I will definitely check them out. I’m sure that lip gloss looks lovely on you! Always enjoy your posts, they super fun to read. Can you review Vain Pursuits too please? I’ve started hearing about them more and more and I’d love to hear what you have to say about them! I have not heard of Vain Pursuits before. I will add them to my list of brands to check out. Thanks for the recommendation and for reading! The blushes are so lovely! It’s hard finding nice pigmented mineral colors that aren’t made with a ton of chemicals. This looks like a company I’d definitely want to purchase from. I really was a bit hesitant that I could apply mineral makeup but the blushes went on super easy. I was really impressed at how well they worked for being a natural product. Right up my alley! Happy to know about these guys! I’d love to try this brand of makeup – hadn’t heard of them before. Thanks for the chance! You’re most welcome. Good luck in the giveaway! Loved your Blog LIsa I havent heard of this before but would love to Win to try!! Thank you! I am starting to become a convert myself. Thanks for reading! I have never heard of this brand,but would love to try these products! Skin issues can really make it tough to find good beauty products. My eye area is fairly sensitive and these products were great. Good luck with the giveaway. 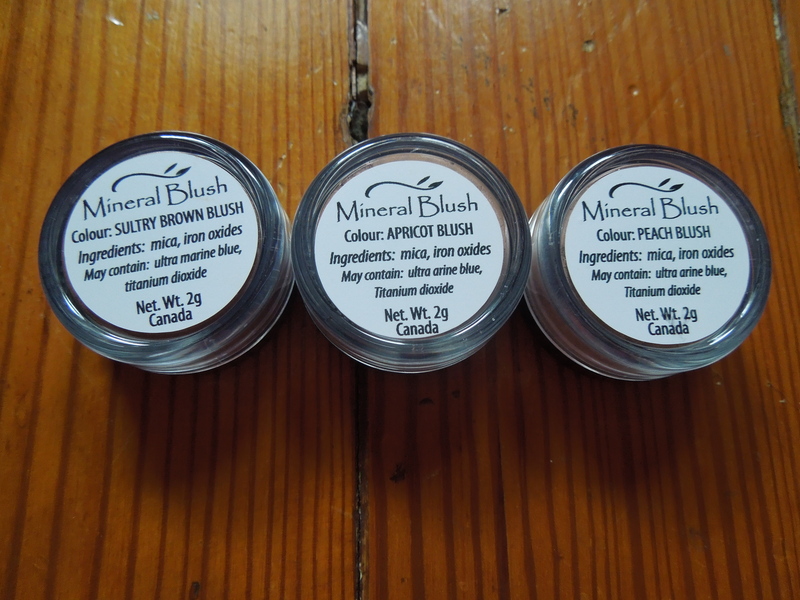 I have a special little place in my heart for mineral cosmetics! They tend to be so much smoother and softer on my skin. This is important for me due to the fact that I have a skin condition on my face and some parts of my body. So I have super sensitive skin. However, I have never heard of this brand or tried a vegan free line. I can imagine how smoother and less irritating that would be with being vegan free! Love the colors and great detailed review. Would love to try for myself! Thanks 🙂 good luck to everyone! I really like mineral make up but I had issues with Bare Minerals. Trying Tarte now but open to others! I got some free Bare Minerals face stuff a few times and I just couldn’t quite get the hang of it. 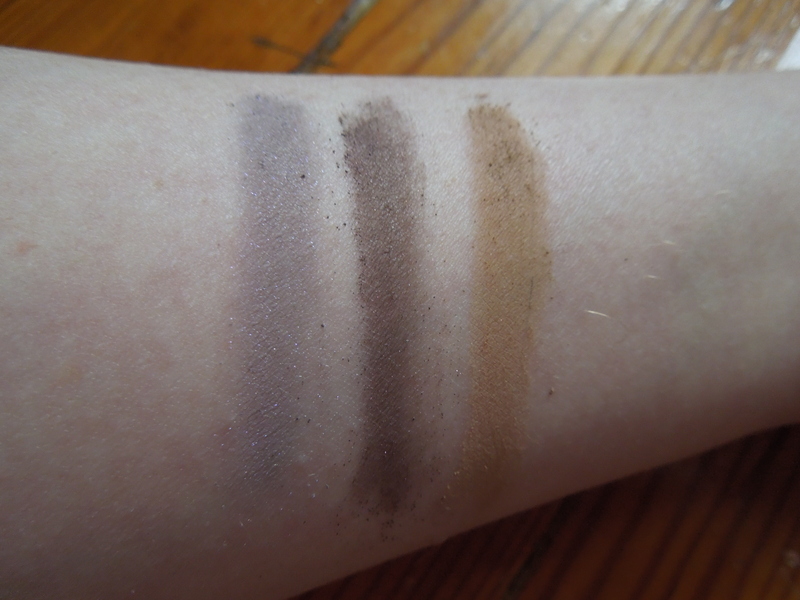 But I’ve had a much easier time trying out the eyeshadows and blushes from Earthlab. Your most welcome! It’s really hard to figure out colors when you shop for makeup online. I’m always searching for swatches before I commit!